Cryptocurrencies get plenty of media attention with their recent rollercoaster ride. The main news last year was Bitcoin’s rapid rise from $1,000 to $20,000, while the fixation this year is its rapid decline. At the height of popularity, CNBC was reporting that the craze was so hot that Americans are mortgaging their homes to speculate into cryptocurrencies. The advantages of cryptocurrencies are well documented. They allow for immediate settlement, fraud prevention, low fees, privacy, universal access and recognition and decentralisation, which prevents situations such as a central bank unilaterally deciding to increase its supply. All these fuelled the emergence of cryptocurrencies, but it is the headwinds that resulted in US$500 billion being wiped out in 1 month. If you look beyond the hype, you will realise that cryptocurrency is the ‘show horse’, while its underpinnings, blockchain tech, is the ‘work horse’. For you to understand that, we will examine controversies and limitations surrounding cryptocurrencies against the strength of blockchain. The first major headwind blowing against cryptocurrency would be the perception that the price of cryptocurrencies is highly inflated, also known as a bubble. After Bitcoin’s spectacular 1,900% rise in 2017, Goldman Sachs condemned Bitcoin and Ether with comparison to the historic Dutch Tulip bubble in their report, Outlook for 2018, released in January 2018. If accusations of bubbles were not sufficient, cryptocurrencies have lost their advantages of immediate settlement and low fees. Cryptocurrencies are the victim of their own success. As they grow bigger, their limited block size means that we require more time and money to complete a transaction. Bitcoin requires 6 confirmations by miners before the transaction is considered complete. In the earlier days, when there are more miners than transaction, transactions can be completed in seconds for a modest fee. Those days are over and as the chart shows, you can wait for infinity if you don’t provide enough incentives to the miners. Now, waiting for infinity to get your transactions completed is obviously not a good idea. Traditional blockchains derived from traditional cryptocurrencies have the similar limitations. They have limited block size and miners have to compete to be the first to solve a hard equation to get the rewards. As a result, 99% of the mining power is wasted. Zilliqa is one of those new generation blockchain solution. 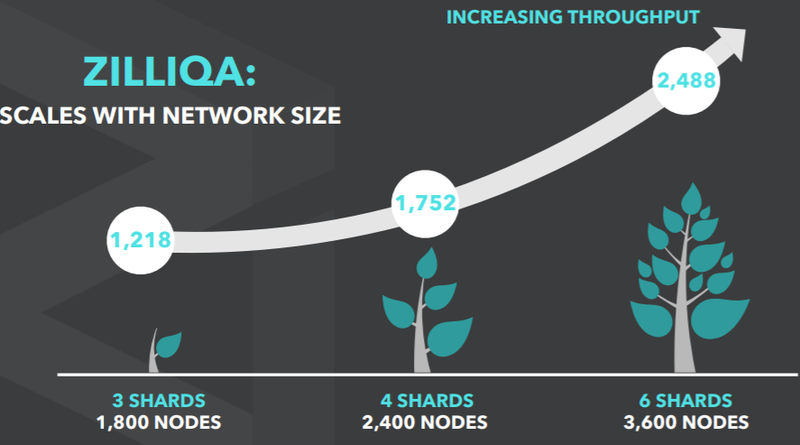 Instead of forcing millions of miners to compete to solve one problem, Zilliqa shard each problem into multiple portions for each miner to solve. Therefore, instead of being limited to 7 transactions per second for traditional blockchain, Zilliqa can theoretically allow 15,000 transactions per second on their blockchain. This is substantially more scalable than Visa’s 8,000 transactions per second, but this is still pending development. Based in Singapore, Zilliqa aims to raise US$20 million to turn this potential into reality and the world is watching. If Zilliqa is successfully, it has a chance of reaching Visa’s US$282 billion of market capitalisation. That said, its ability to thwart hackers will be major test point for its success. Besides the public sector, the financial industry is also rooting of the blockchain technology. A research house, Autonomous Research, found out that banks spent US$54 billion annually for back office activities such as clearing and settlement of trades, custody, financing and regulatory reporting. With higher levels of automation, banks are expected to save US$16 billion off their bill with blockchain. The reduction in the settlement time will also release $6 billion in capital held by financial institutions as they wait for 1 week for international transactions. Their clients also incur hefty fees in the transaction process. Another area which will benefit would the 1 month waiting period for loans to be settled. Of course, this can be mitigated by the digitalising the accounting process with a reputable vendor such as AI Accountant. While cryptocurrencies are banned in countries like China and South Korea, the Republic of Georgia used a private blockchain network for land title registration and bitcoin blockchain for verification. The country is also leveraging on blockchain to create smart contract for notary services and information verification. The Republic of Estonia created an electronic identity system which will allows its citizen to vote in elections and company governance. The Monetary Authority of Singapore is on a project to tokenise the Singapore Dollar based on the Ethereum blockchain. This would reduce the cost and time needed over overseas transaction if the SGD token were to succeed. Other countries such as Australia, UK, Switzerland and Russia have their own blockchain projects. Blockchain has been the unsung hero and we haven’t even touched on the various use cases of blockchain such as building decentralised applications (Dapps) for different industries. Based on the smart contract technologies, blockchain enabled Dapps can fight fraud and inefficiency in the digital advertising space for example. The use cases of blockchain is obviously a topic for another article. For now, we bring recognition to the technology that will likely change your world but has not received its due attention.